As the saying goes, "there is no off season in racing." Although the team has been together for three years, with the addition of two new drivers this year, we really have our hands full. 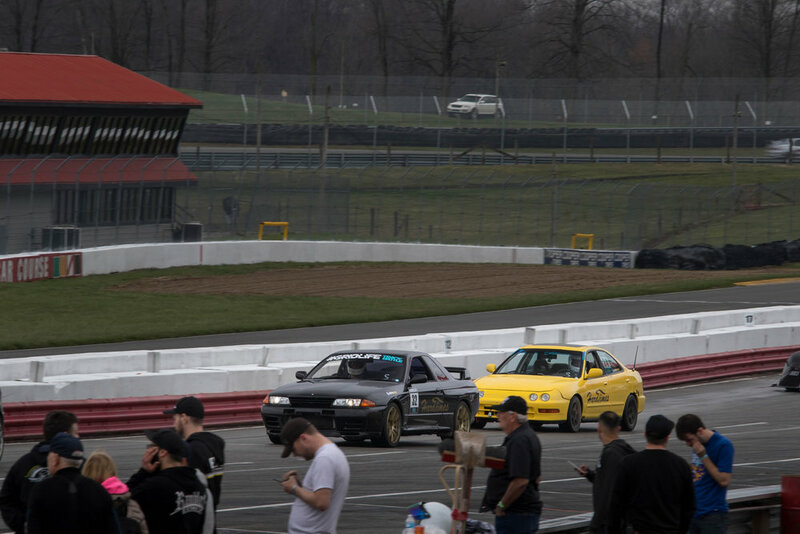 GRIDLIFE's 2017 season-opener was also at Mid-Ohio, but instead of rain like we had this year, we had to deal with snow and temperatures hovering around 30 degrees! Needless to say, we left Round-1 last year hungry to put down more laps on Mid-Ohio's famed course. 2018 would give us that chance and we planned to take full advantage of the opportunity. Preparation for Round-1 started months in advance with Mike Mattlia's white DC2 Integra Type-R clone. He wanted to focus on safety so we fabricated a custom half-cage in-house at Hard Times for the Integra. Once installed it paired quite nicely with new Recaro seats and harnesses, along with Mike's new driving suite and HANS device. The Integra has build has spanned the last year or so and we put in big-effort to ensure it met the GRIDLIFE rule set for Street FWD class. The safety additions were the final addition and we expect the Mike's DC2 to be a real contender this season. The 2018 GRIDLIFE season marked a big change for team member Mark Bucheit . Last season saw him behind the wheel of an Infiniti G35, but he has stepped up to a BNR32 Skyline GT-R this season. 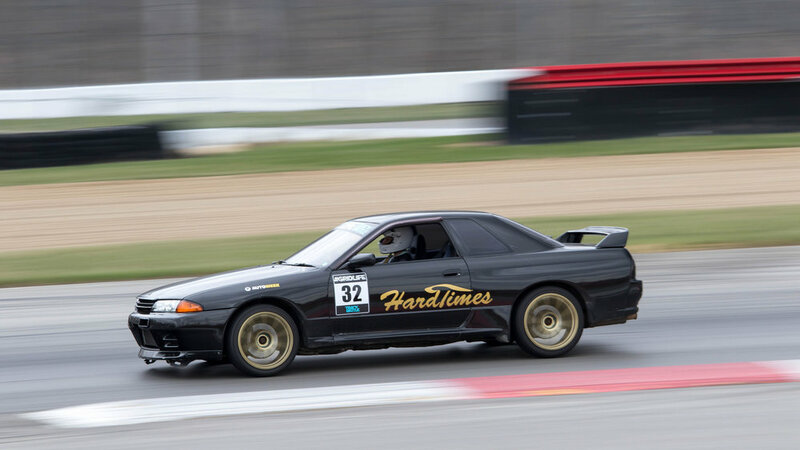 Hard Times Racing has plenty of experience with the BNR32 chassis and we're well aware of what it takes to make them reliable and perform on the edge on the track. However, with such a short amount of time to prep the newly acquired GT-R for Round-1, we decided to keep the initial modifications light to ensure a trouble-free first weekend on the track. New tires, light Advan wheels, upgraded brakes and a fluid change was all the Skyline needed, because after-all, it's a GT-R. For Mark, his main priority was to get comfortable behind the wheel of the new chassis and it's advanced ATTESA AWD system. The newest addition to Grid Life Racing, Less Epps, also happens to be one of the most talented drivers I've ever met. Although he has a plethora of chassis in his stable to choose from, he decided to focus on Street FWD class for the 2018 GRIDLIFE season. He chassis of choice is a DC2 Integra sedan with a nice assortment of performance modifications. The night before departing for Mid-Ohio the Integra suffered from a blown brake line. Instead of fixing the single line, Lester decided to replace ALL of his brake lines at the last minute to ensure a trouble free first round. Lester certainly showed his true colors, didn't give up and, cemented the decision to bring him on as part of the team! With ambitions high as usual I decided to, once again, re-work my S13 Silvia K's from the ground up. The main focus on the off-season was aero and air-flow improvements. A custom V-mount intercooler and radiator setup was fabricated in-house at Hard Times with the necessary ducting to ensure the flow of air hit both heat exchangers efficiently and excited the engine room through the hood duct with minimum turbulence. A big change in aero occurred with the addition of a genuine Rocket Bunny V1 kit, which afforded me the opportunity to improve my wheel and tire package. With the support of Konig wheels, the Silvia received a set of their 18x10.5J Dekagrams that weighed in at only ~16 pounds each! Not only was I able to reduce rotational mass, but the new wheels allowed me to increase grip massively with 295/35R18s in the rear and 255/35R18s up front. The upgrades greatly improved the handling characteristics and grip of the S13. With only 5 days to go before Round-1, it was a mad rush to get everything finished including a livery that pays homage the Bob Sharp Racing team. Work went down to the wire and there was no time to test and tune before loading the Silvia into the trailer before heading to Ohio. After a 7 hour drive from Chicago to Mid-Ohio Sports Car Course, all the cars and gear was unloaded and we set up camp. Throughout the process of running the cars through tech inspection tension started building for the day. The team knew that we would have only one or two sessions on the track to put down respectable lap times. We were all either shaking down setups or behind the wheel of a new chassis, which just increased the tension. Lester had never driven Mid-Ohio, so on top of having to learn a new car, he also had to learn a new track! Mark led the team onto the track in his GT-R followed by Mike and Lester in their Integras with my Silvia rounding out the group. My goal was to push the car a bit more on every lap, while monitoring temperature levels and getting used to the new handling characteristics. On lap 2 Mike and Lester gave me the point-by, and I pushed the Silvia to 65% while constantly checking the gauges, trying to put heat into the tires and keeping my ears open for any mechanical issues or tire rubbing. On the third lap in I felt a wave of relief fall over me. The S13 was performing flawlessly. A quick look at the solo showed that I had cut a 146.08 lap time, very respectable for a shakedown. The gas gauge showed I was running on fumes so I pitted and stepped out of the Silvia with a huge smile on my face. Anxiously I waited for the rest of the team to return to the pits and one-by-one they rolled in and it was hugs and high-fives all around! After the track high subsided, we started studying our lap times. We suspected our Street FWD class competitors were looking good and boy were we right! After one session Lester was sitting in first place with a 156.55 followed closely by Mike with a 159.34, putting Hard Times Racing in 1st and 2nd place! The high was short lived as worry set in knowing that rain was going to hit the track sooner than later, which it did during the lunch break. Seeing as my Silvia was on slicks, my day was over. Mike also decided to retire for the day, satisfied with his performance thus-far. Although there were plenty of attempts to increase lap times, the rain resulted in the dry times set previously standing over the weekend, leaving Hard Times on top of Street FWD class. It was surreal knowing that we had placed on the leader board with a whole weekend of wet track time ahead of us. Saturday would see track conditions improve from soaking wet to a damp track along with a late entry to the Street FWD class by Anthony Cuthbert in his Civic Type-R, a car know in this class as a ringer. Cuthbert would end up bumping Make and Lester down to 2nd and 3rd place respectively. As the sun set, hard-earned beers were shared while we swapped war stories. It was clear that Sunday would be another day of rain and that the lap times set on the dry track would stand. On Sunday, Lester and Mark put some work in on the wet track to improve their driving skill while the rest of us sat by and watched. Eventually, we packed up all our gear and loaded the cars in preparation for a long drive back to Chicago. All-in-all it was a great weekend, and despite the fact that we only had four of the seven Hard Times Racing car's out that weekend, a tone for the season had been set. Our focus now is on ensuring all seven cars are ready for Gingerman Raceway in South Haven, Michigan for GRIDLIFE Midwest. There's plenty of work to do, but we are determined bunch and as I always say, "You've got to be there to win!" This is the first in a on-going series of articles written by our good friend Charlie "Cowboy" Ensslin, who is the driving force behind Hard Times Racing and quickly becoming an icon of the GRIDLIFE time-attack series. Charlie will be bringing you the time-attack perspective throughout the season and we'll be providing the drift point-of-view for some of the rounds.